Home > Ask Our Experts > Ultrasounds - What is EFBW and GMS? Q.I am almost 5 months pregnant and recently I had an ultrasound which shows an EFBW of 323 GMS. What does this mean? Thanks for your question and congratulations on your pregnancy. During pregnancy, a number of ultrasounds and scans are carried out to monitor how the pregnancy is growing and the growth of your baby in the womb. Ultrasounds are painless and safe, so it’s an ideal method of scanning for pregnancy. It’s standard practice for ultrasounds to be carried out at the stages of three months and five months into pregnancy. Many hospitals provide women with a printed copy of the scan to take home afterwards – often they very clearly show your baby, although other times they could be facing the wrong way, have a limb crossed or be obscuring the face somehow! It’s a bit hit and miss when photographing babies in the womb like this, but it’s a lovely memento to take home. At the bottom of the scan there are various printed letters and numbers, including EFBW and GMS. Although it may seem like a slightly strange acronym, EFBW actually stands for Estimated Fetal Birth Weight – or the weight that your baby could be when he or she is born. The second part, in your case 323 GMS, stands for the estimated weight – i.e. 323 grams. The meaning of this acronym should have been explained to you at the scan (remember, if you are unsure about anything, it’s always fine to ask – although it’s easy to forget at the time and only think of things later on). The estimated weight is also often given out to mums, although it’s usually given in the form of pounds and ounces rather than grams. 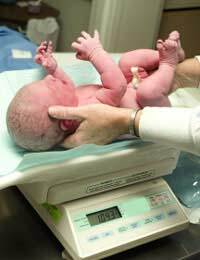 Pounds and ounces is the form of measurement that babies are traditionally weighed in and it’s what most people can understand in terms of baby weight. It’s worth bearing in mind, though, that this is very much an estimate at this stage, as the actual weight can vary considerably. In fact, it can vary by about 25%. Due to the variation in actual birth weight, not all hospitals do give out details of the estimated birth weight, which is why you may not have been told what EBFW meant. During the next few months, your baby will be increasing in size and continuing to grow and develop in a variety of ways. I am 21w 1day pregnant and my EFBW is showing 454 gms. It is normal or not? Plz tell me about this query. We can't give individual medical advice, please ask your midwife or GP. My ultrasoundreport mention 133GMS approximately. Please tell me my baby is healthy weight and complete details. I'm 26 weeks pregnant and my EFBW Is 975. Is it normal?? Plzz. Help me.. and also my ultrasound shown a cord around d neck.. is it normal.. plzz tell me.. I am at 38 W 5 Days...I had an Ultra sSound Scan today, EFBW -3384g I wish to know does this is the current weight or appx weight at delivery.?! I am 16 week pregnant and my E.F.B.W is showing on ultrasound 136 gms .tell me clearly on details please. I am 34 weeks pregnant my EFBW is 2433 grams +/- 360 grams. . I am scared already does it mean my baby could be 2.4 kilo?